Description: Bird's-eye view of the Seat of War, arranged after the latest Surveys. 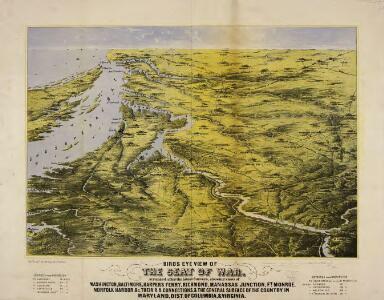 This Bird’s Eye View of the Seat of War, published by Prang, displays the region around the Chesapeake Bay and Potomac River, showing Washington, D.C., Baltimore, Harper’s Ferry, Richmond, Manassas Junction (Bull Run), Fort Monroe and Norfolk Harbour. The map also details railroad lines. It is possible to see a drawing of the Capitol building where Washington, D.C. is labelled.